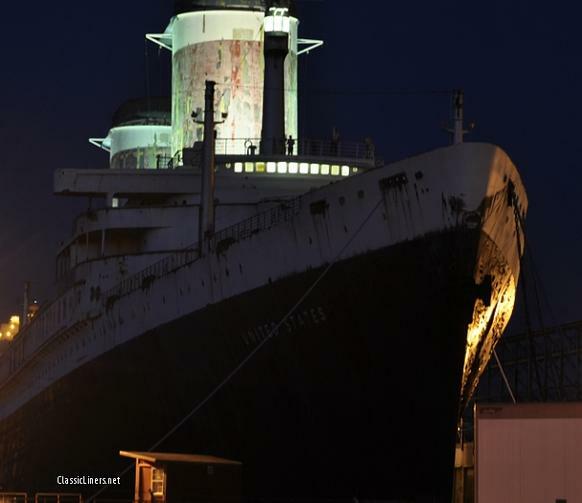 Ever since the completion of her record breaking maiden voyage in July 1952, the illustrious S.S. UNITED STATES has captured the attention and imagination of the public from all over the globe. She is quite easily America's greatest ocean liner; a beautiful example where design, and construction meet as a true testament to the life long work of her chief designer, William Francis Gibbs. For the better half of the early 20th century, the United States was not in the business of building what were known as 'ships of state' - generally the largest and fastest super-liners that were unequaled in style representing the best that the British, French, German and Italian already proved they could build. 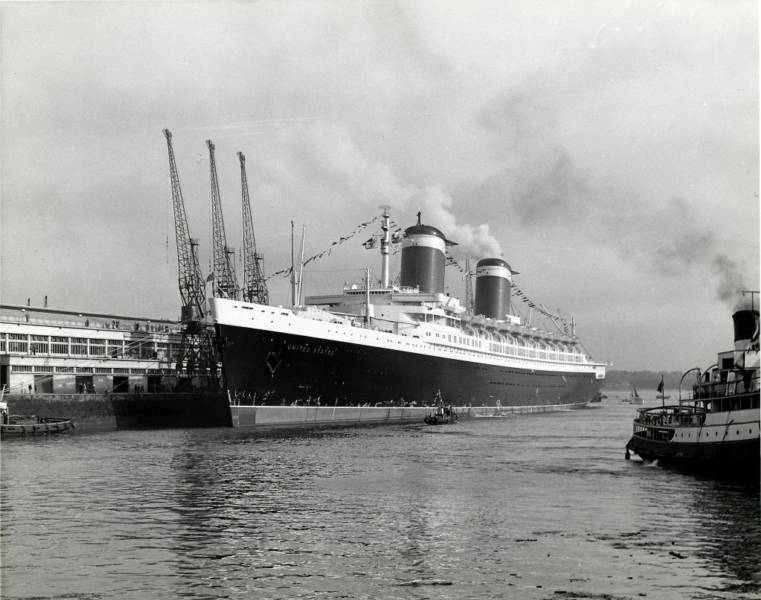 The mentality that the American steamship lines could not compete with the likes of such greats as the stately QUEEN MARY, the ultimate NORMANDIE, the beautiful REX and the streamlined BREMEN changed after the second World War. 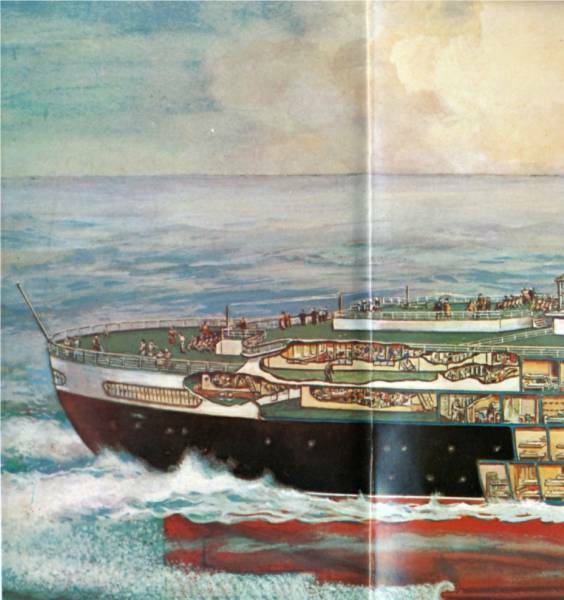 Once it was seen that the 1000' foot Cunard Queens- the MARY and the ELIZABETH proved they could carry thousands of troops at a time, the federal government took keen interest and plans were enacted for America to build its own super-liner with a large percentage of subsidizing coming from the government, in exchange for its use in times of war as a troop transport. 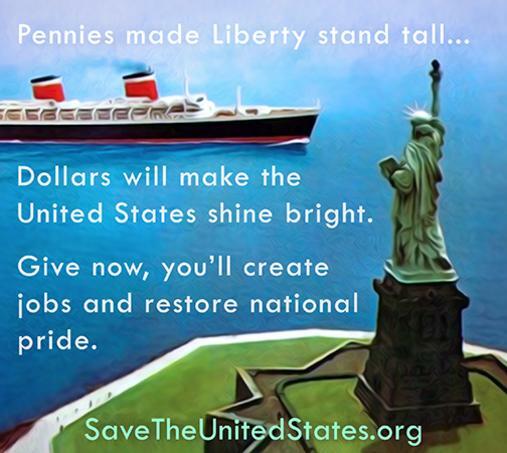 In fact, enough U.S. funds were set aside to build several liners. Two of the ships would be the basis for construction and form what would become the INDEPENDENCE and CONSTITUTION for American Export Lines, and the AMERICA and the UNITED STATES for the United States Lines. While the Big U- as she became affectionately known as- proved to be a successful liner, it was not enough to overcome the technological race for the skies as the jet age took a great majority of business away from the steamship lines during the 1950's and 1960s. Rising fuel costs, and labor strikes spelled the end for the great ocean liner as many of these passengers ships were forced to either adapt and find work under the new age of cruising or face the scrap yard with the exception of a handful of these same liners finding long periods of lay up. 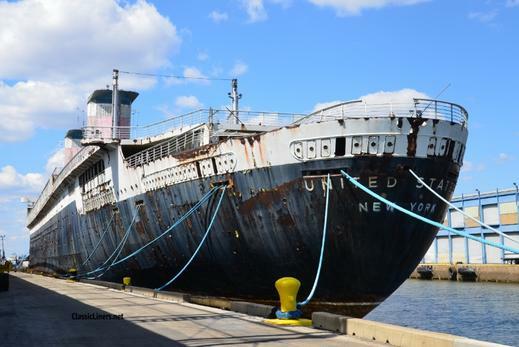 The greatest of which has surely been the SS UNITED STATES as she has spent more time in lay-up than at sea. Nearly all of these 'ships of state' were simply to costly to maintain and keep in service. 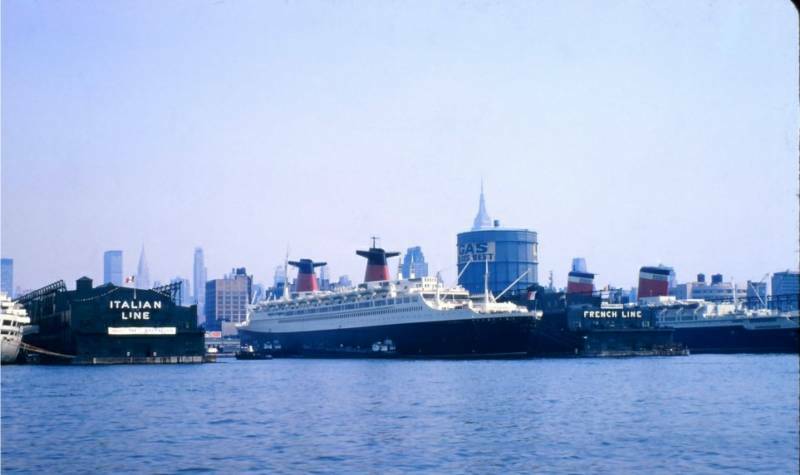 The British Cunard Line threw in the towel on the MARY and ELIZABETH in 1967 and 1968 respectively. One of course, would find a future in California, while the other, trying to duplicate the role of her running mate on the opposite coast would soon burn and capsize as a result of sabotage while being converted to her new role. French Line's S.S. FRANCE was withdrawn from service in 1974 and lay 'forgotten' for nearly four years before finding a new life and work as a cruise ship in 1979 thanks to a major overhaul to become the legendary S.S. NORWAY. 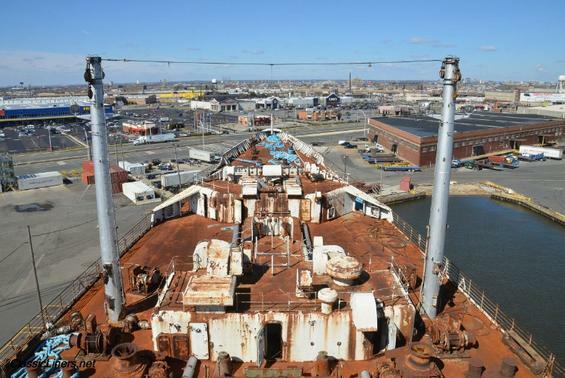 For the S.S. UNITED STATES, 1969 became her last year of service as a result of the aforementioned surmounting airline competition, fuel costs, and labor strikes. Since the 1970s, the Big U has changed ownerships several times, not to mention that she has been largely neglected, deprived and later striped of her valuable interiors. To make matters worse, she has been largely forgotten about by the general public with perhaps the occasional news article, followed by the usual small glimmer of hope that she would return to the service. While this idea may seem far fetched to some, the importance of at least saving and preserving this American symbol- one that bears our countries name- really cannot be overstated. 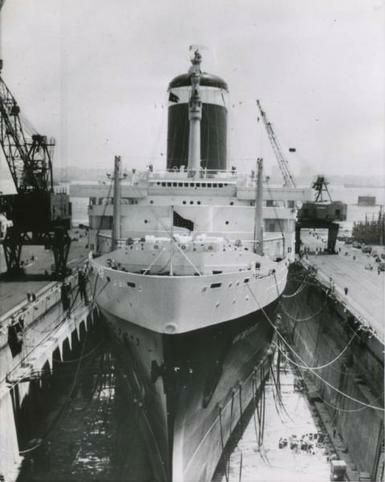 May 3rd 1948 Newport News Shipbuilding receives the contract to build the proposed super-liner, winning the bids over the New York Shipbuilding of Camden, NJ for $67 million. The yard was given 1128 days to finish construction. April 5, 1948 The press is invited to the Manhattan offices of Gibbs and Cox at 21 West Street. It is here that a preliminarily model of the ship is unveiled for the 1st time. 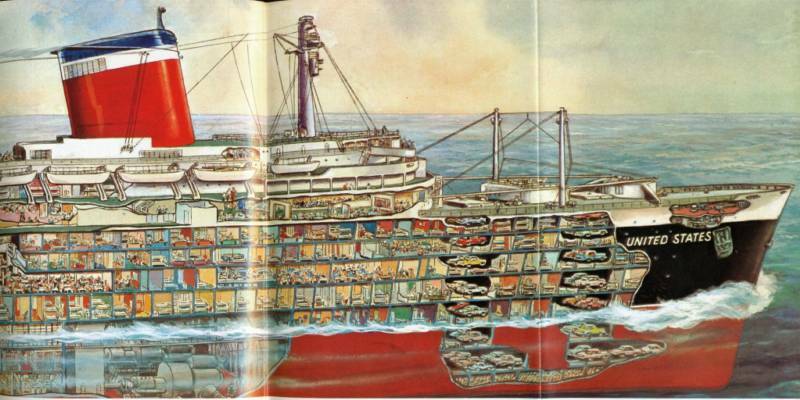 May 1949 The operating line of the news vessel, United States Lines begins to make a formal selection of the new super-liner. Rumors of the names include: Mayflower, Columbia, Hudson, Manhattan were also considered as was American Engineer. The US Navy had weeks before canceled their plans for a super carrier with the name United States, allowing the name to become available for commercial service. May 3 1949 Newport News DryDocking Company sign final paperwork for the contract between the United States Lines (U.S.L.) to build the ship. Feb 8, 1950 The first section of Hull #488 is placed in graving dock #10. This 55 ton section would form the S.S. UNITED STATES. What essentially was then known as a 48,000 ton liner had by this point grown to 50,000 tons. May 23, 1951 The aft funnel is fitted onto the ship, each of the two funnels measures 60 feet long and 55 feet in height. 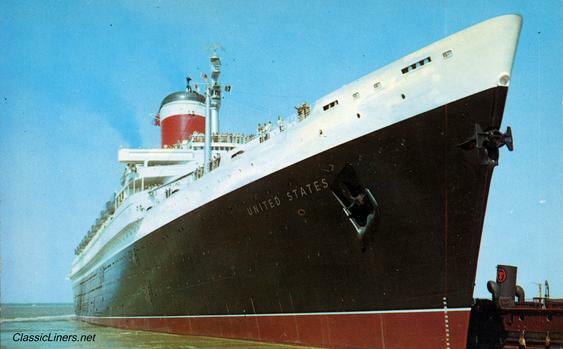 June 23, 1951 The ship is christened and named by Mrs. Tom Connolly as the UNITED STATES. New Years 1952 The two American built liners S.S. AMERICA and the nearly 85% complete S.S. UNITED STATES meet side by side for the first time. June 9, 1952 More extensive and official trials begin. It was during this short voyage where it was recorded that the ship was steaming at 22.3 knots- in reverse! 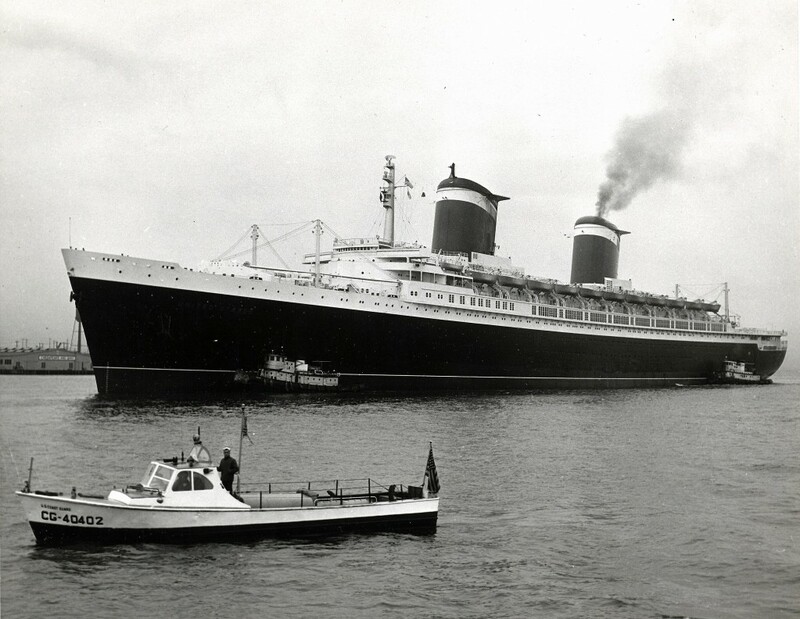 June 20, 1952 The S.S. UNITED STATES is officially handed over by the government to its operator, U.S.L. in a ceremony in an office in Hoboken, NJ. The ship was delivered at the same day at Newport News where the line's Commodore, Harry Manning took command of the sleek new 990 foot liner. June 22, 1952 1,200 invited guests embark for an overnight cruise from her birth place to New York for a gala reception. 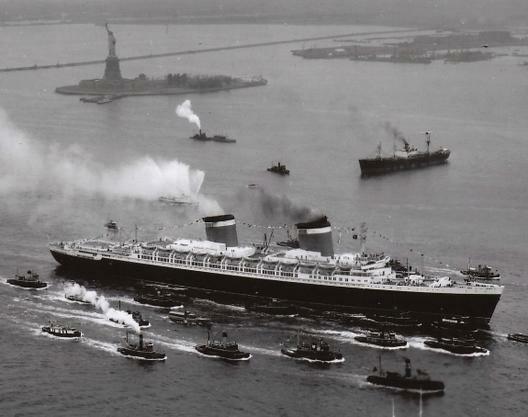 June 23, 1952 S.S. UNITED STATES arrives in New York- her home port- for the first time welcomed by a flotilla of small boats, salutes, cheers of many as she is escorted up the Hudson River to Pier 86. 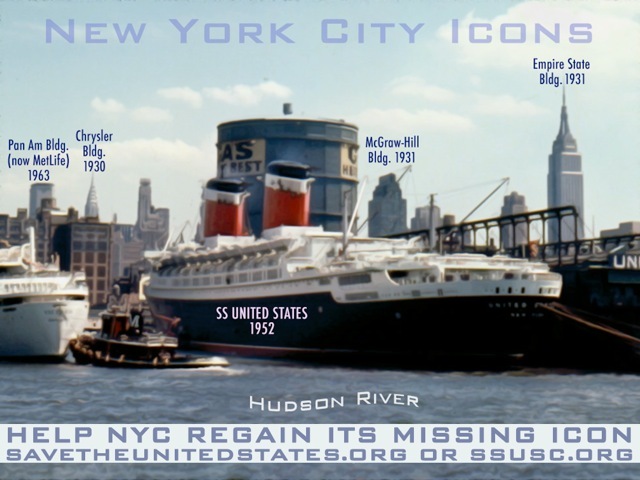 It is New York Harbor's most memorable maiden arrivals in ocean liner history. 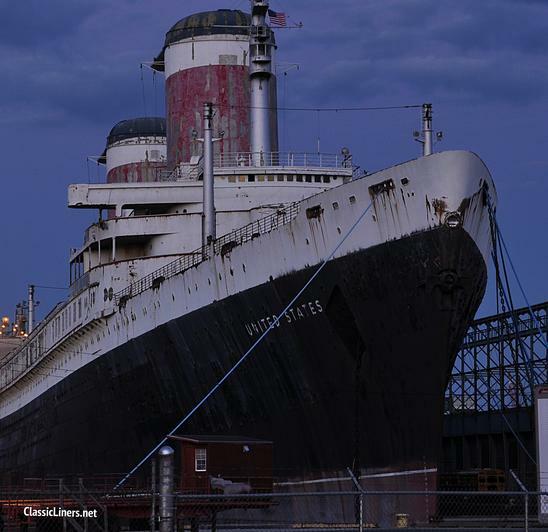 April 23, 2012 A press briefing was made by Conservancy together with the mayor of Philadelphia announcing the filming of the movie Dead Man Down aboard SS UNITED STATES. 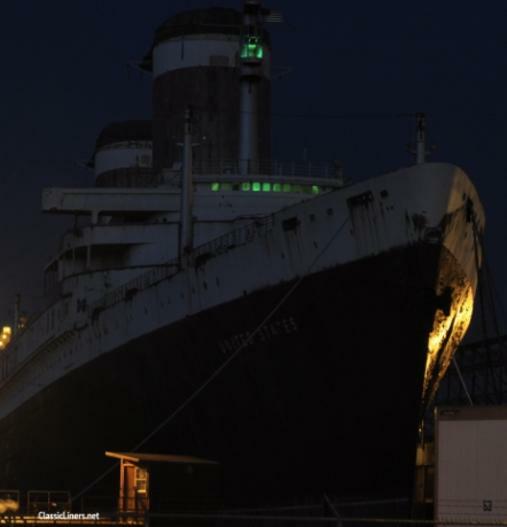 June 15, 2012 The 60th Anniversary of the ship is celebrated onboard with lighting of the ships funnels and a screening of the new Conservancy documentary, SS United States: Made In America. July 3, 1952 Noon The ship officially casts her lines from New York to begin her record breaking, illustrious maiden voyage across the Atlantic. 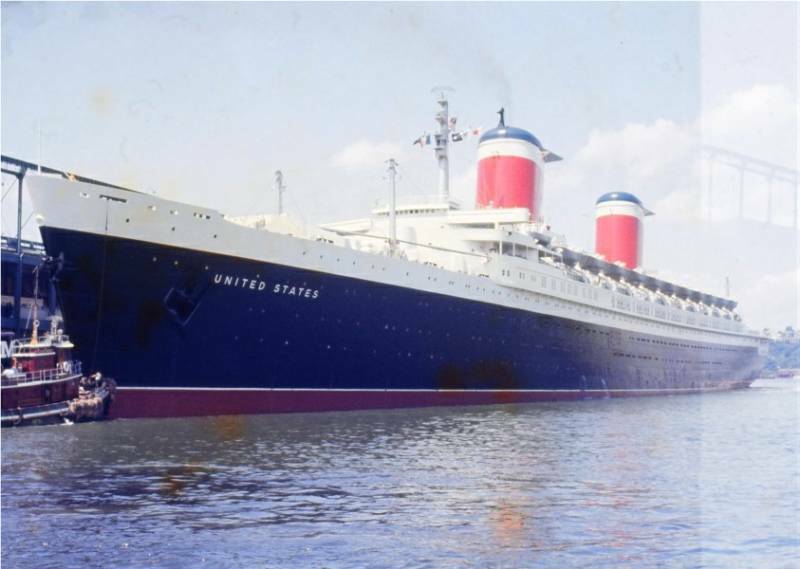 July 7, 1952 5.16 am (GMT) With an average eastbound speed of 35.59 knots and making the crossing in 3 days, 10 hours, and 40 minutes the S.S. UNITED STATES officially captures the Blue Riband from the R.M.S. QUEEN MARY (at 3.9 knots faster). Whistles were sounded and cheers could be heard throughout the trip from this point. Despite the early hours the band began to play and some passengers who had been awake throughout the night could be seen even starting a conga line. 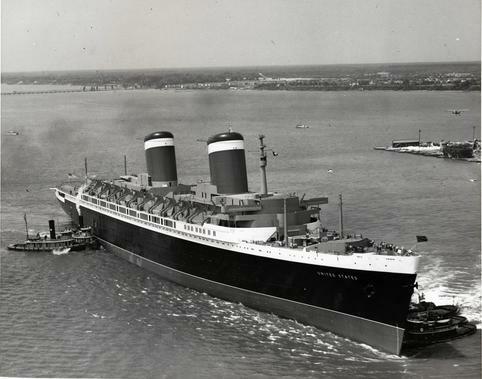 July 8th 1952 The S.S. UNITED STATES arrives at Southampton receiving an enormous reception. Some say greater than at New York as well as Le Havre. History also suggests that the Southampton reception was the greatest given to a ship the world has ever known. September 20, 1958 The S.S. UNITED STATES logs her millionth mile, inbound off the Statue of Liberty. October 1958 With the help of the Boeing 707, airline traffic now dominated the North Atlantic as more passengers were taking to the air rather than the more traditional journey by sea. September 6, 1967 William Francis Gibbs, the brain child behind the legend of the ship dies at the age of 81. September 1, 1960 The U.S. Department of Commerce announces the contract to carry military dependents to and from Europe on the S.S. UNITED STATES and S.S. AMERICA are terminated. This was a severe blow for the U.S.L. who were already seeing dwindling numbers of passengers sailing due to airline competition. As a result, all cabins had to be sold commercially as military dependents filled a number of cabins. Like never before the company had to advertise and sell their product with focus on comfort, food and benefits of sea air to the public on order to fill the vacant space. February 1961 In an effort to save operating costs, the U.S.L. has the UNITED STATES officially remeasured from the previous 53,329 tons to a lower 51,988. January / February 1962 U.S. Government regulations made clear as the ship was under construction that any ship in the U.S.L. fleet could not deviate from their intended line service, no matter how unprofitable the ship became. U.S.L. management protested and pleaded for these changes for months. 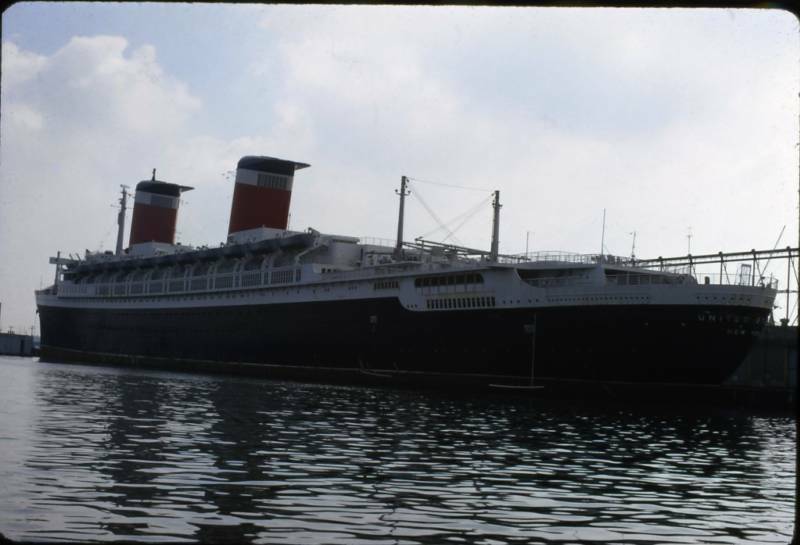 In November 1961, the S.S. AMERICA was permitted to make her first cruise. 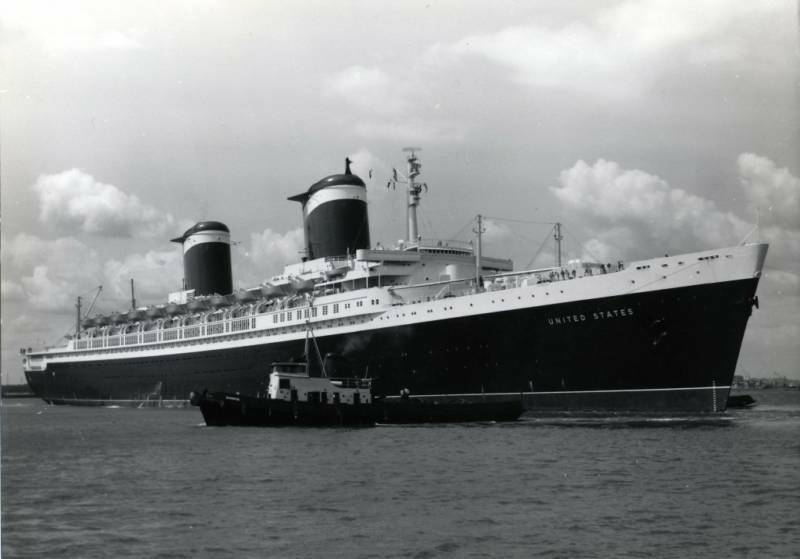 The S.S. UNITED STATES followed suit at this point in 1962, embarking on two week cruises out of N.Y. making calls at Nassau, St. Thomas, Trinidad, Curacao, and Cristobol. Fares began at $520. 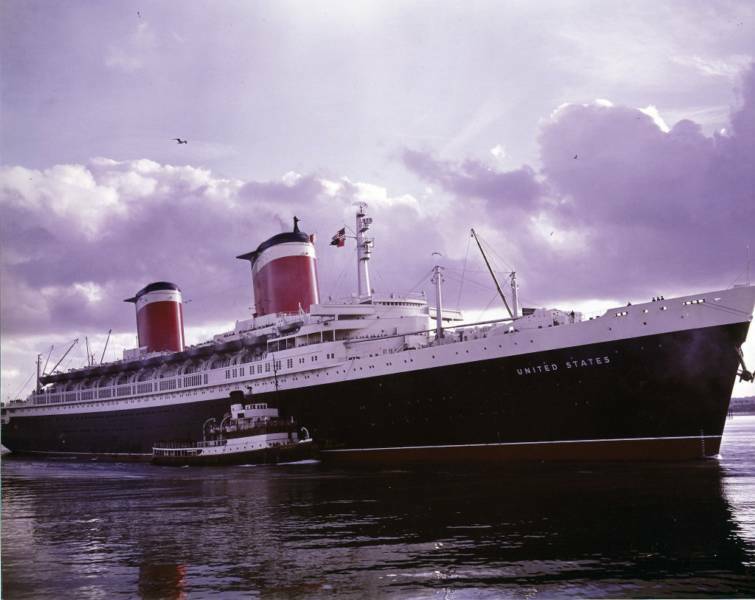 Jan 1962 The S.S. FRANCE enters service. At 66,000 tons she is larger than her American competition with a cruising speed of some 30 knots. With the celebrated French line as operator- known for their service, luxury and their flawless kitchens(galley) the sleek new liner possessed a competitive edge over the Big U. 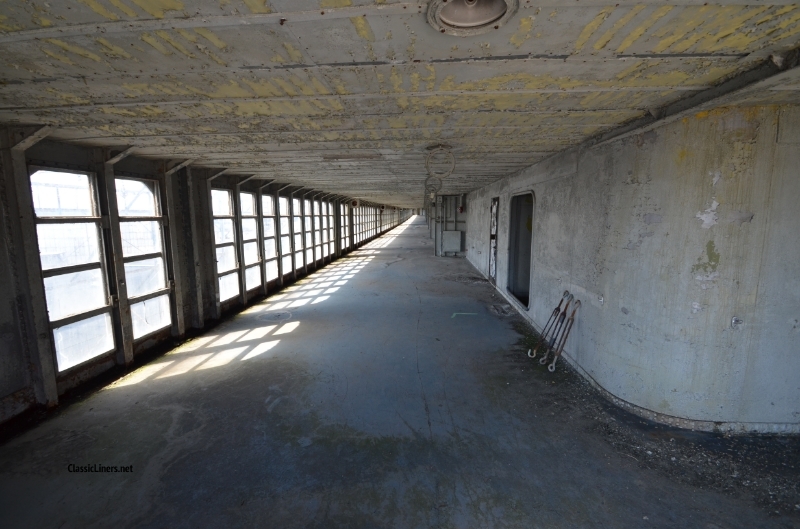 As a result, it was noted that the ship continued to carry fewer passengers as a result. 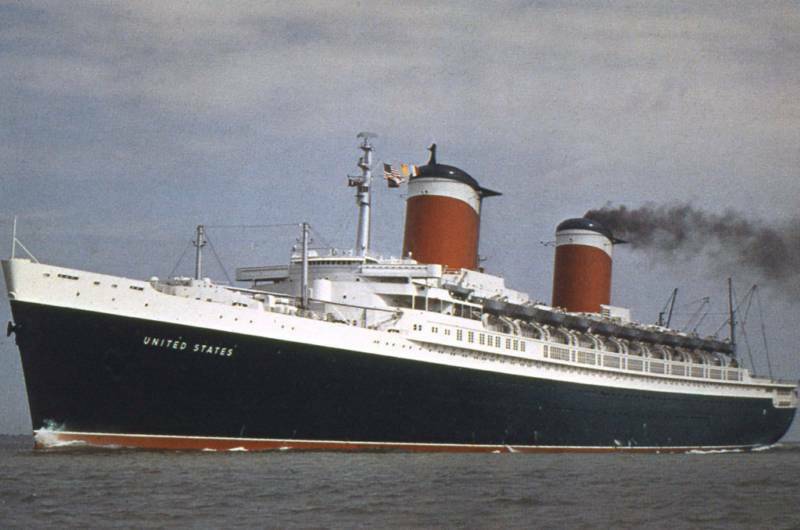 June 1961 Both the S.S. UNITED STATES and S.S. AMERICA are laid up and for the first time since their introductions, the Big U is shut down completely. Labor strikes at various ports- including New York- were numerous, almost commonplace at this point and it began to take a serious toll on not only the S.S. UNITED STATES but nearly every other liner then sailing. It was further noted that it was here that the image of the U.S.L. and its passenger liners became tarnished, indeed perhaps permanently as a result of this mishap involving their laid-up ships, and passengers reassigned to other steamship lines. 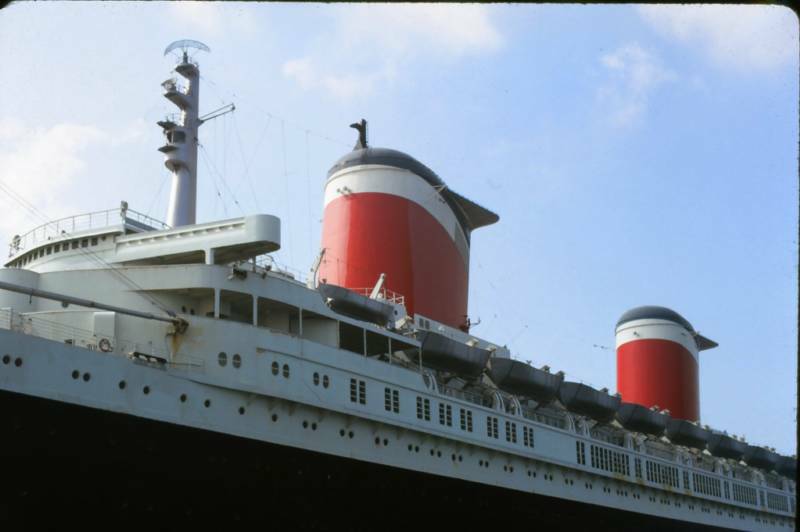 November 1969 The government at this point was subsidizing as much as $400 for every passenger that traveled and the ship herself was losing $5 million a year. This ultimately proved to much for U.S.L and she was unexpectedly withdrawn from service, the future cruise was canceled, and the ship and her crew ordered to tie up at Newport News. With just over a million passengers carried, she had managed to log 2.7 million miles by the time her 17 and final year of service ended. November 7, 1969 The ship leaves on its final voyage from New York. June 1970 The ship was moved from her Newport News berth to the Norfolk International Terminal- it would be her home for the next twenty years. A wonderful image of the brilliant liner with tugboat Ramsey alongside. Authors collection. 1977/1978 The Norwegian Caribbean Cruise Lines in a move to remain competitive to the growing cruise market, was seeking to add a larger liner to their fleet and the idling S.S.UNITED STATES was considered for this conversion. The line ultimately chose her French Line competitor the S.S. FRANCE which was also laid up and nearly forgotten for a period of some four years. Out of that conversion, the ship became the S.S. NORWAY and she would in fact prove one of the most influential and beloved cruise ships of all time. 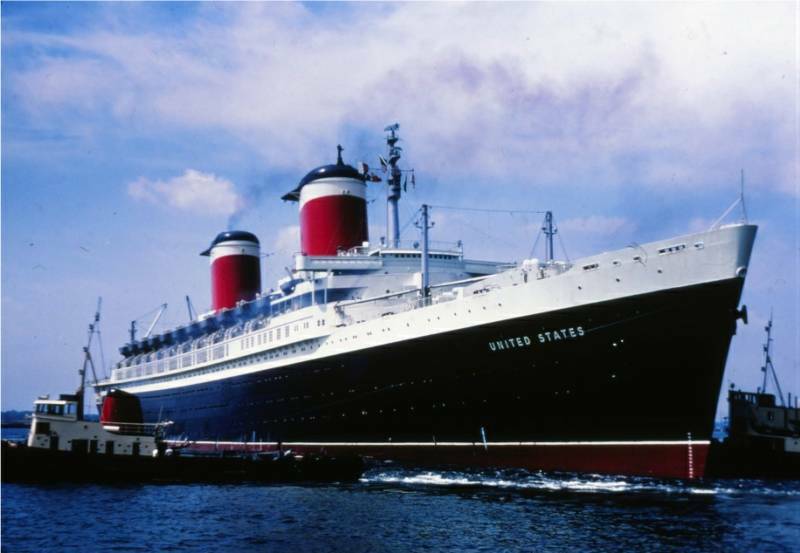 September 29, 1978 Maritime Administration (MARAD) officially sells the S.S. UNITED STATES to Richard Hadley- MARAD was largely responsible for the ship and actually purchased the ship sometime in 1973. Mr. Hadley soon thereafter formed United States Cruises Inc. and had plans to restyle and modernize her as a condominium type cruise ship. June 1980 The S.S. UNITED STATES is moved to a floating dry dock at Newport News & Dry-dock Company for a inspection to ensure her underwater sections were of sound condition. 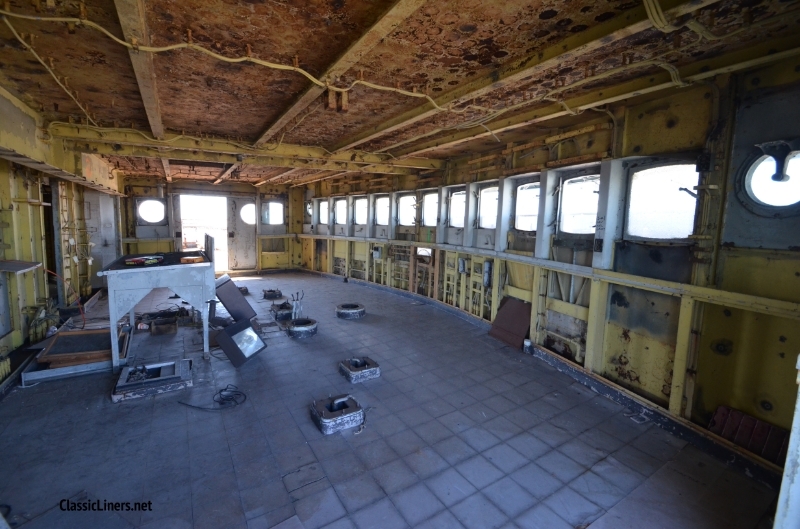 October 1984 Unable to kick start his operation of a new cruise line and in order to pay off accumulated debts, Richard Hadley authorizes that the ship be stripped of nearly all of her interiors and sold for auction. 1991 Richard Hadley, in addition to being billed $165,939 is also asked to move the ship from Pier 15. Winter 1992 The increased debt of the ship and unpaid fees soon escalate - she is seized by federal marshals and placed on auction. Summer 1993 A Turkish interest group called Marmara Marine purchased the ship for $2.5 million and the ship was towed across the Atlantic, slowly, where she anchored for several years off the small port of Tuzla. November 1, 1993 The vessel anchors off the Black Sea port of Sevastopol. 1994 Plans were said to be made, with Turkish interests owning the ship, Sweden's Effjohn International managing her, and the Cunard Line given the task of operating the sales as well as marketing - with the master plan centering around her joint operation with the last ocean liner in service, the QE2. 1995 The vessel is dry docked, stripped and asbestos removed. To possibly help pay for this task, lifeboats were removed and sold. A few of the propellers were lashed to the deck. June 27, 1996 The ship at this time was reported off the coast of Sicily and she was heading towards American shores once again. Plans of being converted and refitted for cruise service never materialized and so it was decided that she was to return to American waters. The Dutch ocean going tug Smit New York with a crew of 15 made a voyage west at four knots. Destination exactly became an affair of mystery and rumor. July 1996 During this month it was said that the liner was to arrive at Boston, possibly at the Navy graving dock. A few weeks later a rumor surfaced that she was to go to New York itself, either in Brooklyn or Bayonne. The Boston plans were reported to have fallen through and nothing ever came of the New York plans. Fall 1997 The liner docks at Pier 82 in Philadelphia, PA where she has remained to date. She was once again seized by U.S. Marshals since $2 million of her $2.5 purchase price was still owed from the 1992 sale. 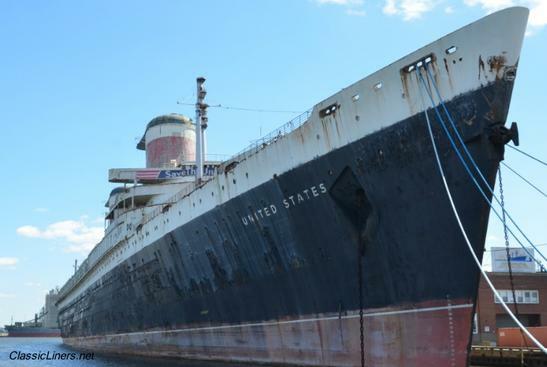 Around this time, Edward Cantor bought her at auction for $6 million, another businessman with plans to revive her as a cruise ship. He soon changed his mind and offered the ship for sale at a staggering $33-34 million. Her scrap metal value at this point was estimated at $2 million. June 14, 1999 (Flag day) 1999 The S.S. UNITED STATES is added to the Register of Historic Places, and the only liner to be placed on the list at under 50 years of age. July 4th, 1999 On three evenings in the weekend of this holiday the iconic funnels are lit for the first time in over twenty years. 2000 It was during this year that plans were said be in place for the ship to be remade into a medical treatment and research center while berthed at Pier 84, adjacent to the USS INTREPID Sea and Air Space Museum. "Floatel UNITED STATES" was another project proposed with her positioned on the west side of Manhattan. February 2003 Edward Cantor, her then current owner passes away enlarging the effects of her uncertain future. April 14, 2003 The Norwegian Cruise Line (a larger and more modern company that initially looked at the ship in 1978) makes a surprising announcement that they have purchased the S.S. UNITED STATES along with the S.S. INDEPENDENCE, for conversion to cruise service for their Norwegian America Lines subsidiary. 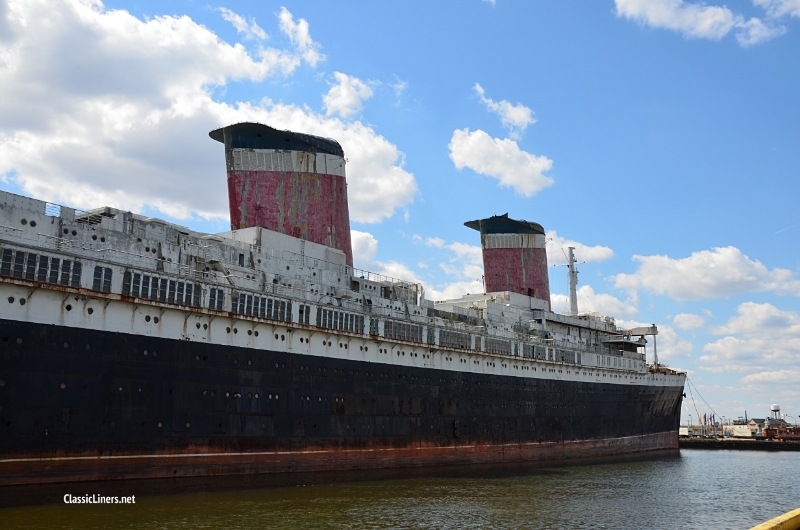 Studies are undertaken, and discussions of possible return to Hawaii cruise service in 2010.October 2, 2004 The SS United States Conservancy officially launches on this date as it champions to save America's greatest ocean liner. At the same time it hosts a S.S. UNITED STATES crew reunion at the Windmill Point Restaurant at Nags Head in North Carolina. The restaurant housed one of the largest collection of S.S. UNITED STATES furnishings and memorabilia in the world.April 24, 2005 An invaluable informational 4 by 8 foot sign is unveiled at the S.S. UNITED STATES Philadelphia pier for the first time. News coverage from two local television channels follows as passing traffic and the occassional curious onlooker has a better idea what graces the pier, and the skyline. The future of our Nations Flagship looks brighter than ever. Support, in most any form is still needed. 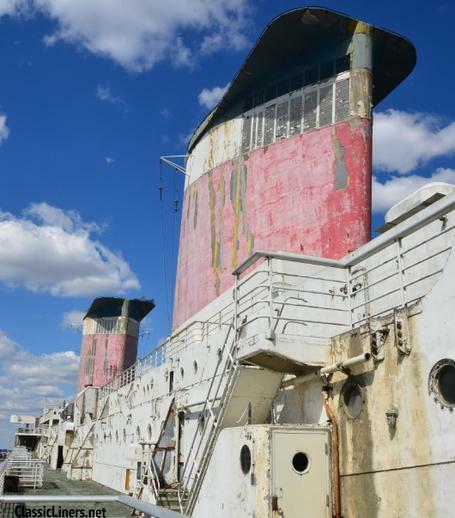 This 'lady in waiting' now has a strong fighting chance to be preserved. 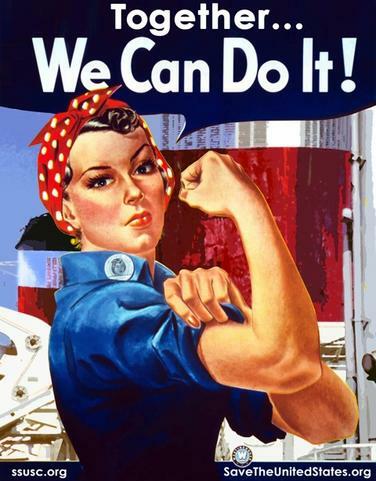 She is counting on us to step up and act. Please contact your Congressman, or State Senator and ask them that help is still needed to save this ship - Save Our Ship.​ In this day and age when so many vintage liners of yesteryear are being lost to the torch, she represents the last hope of something being saved, especially from that past time of mid-ship design that is scarce and distant. Make no mistake, she still have a soul despite being an empty shell- its what's on the outside that matters now. Together we all can save history. 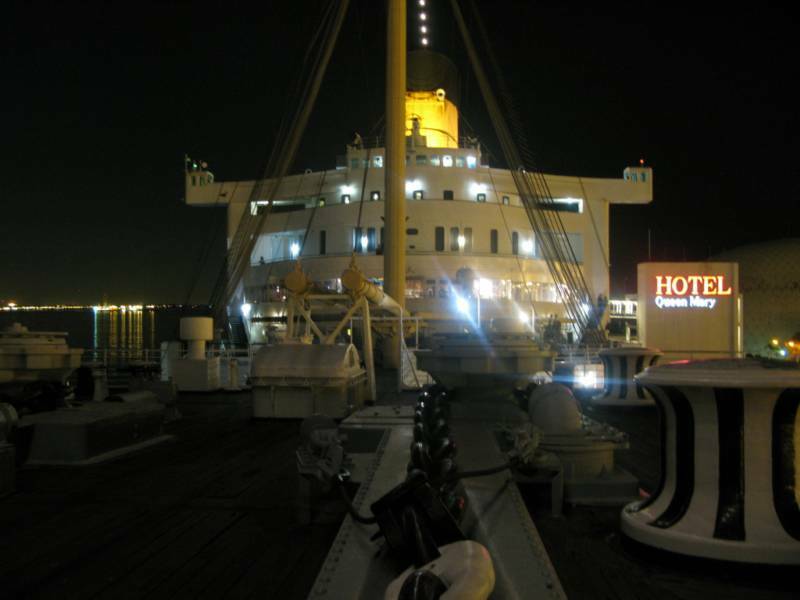 May 3, 2008 On board Hotel QUEEN MARY, the United States Conservancy and Big Ship Films, premieres the landmark and award winning documentary tiltedS.S. United States: Lady in Waiting. Earlier that day SS United States Conservancy board member Joe Rota dedicated and opens a new exhibit highlighting the ships career near the Queen Mary Story Gallery. Just a few weeks later on the 29nd the documentary also premieres in New York. February 10, 2009 Due to the financial situation of NCL America, N.C.L. 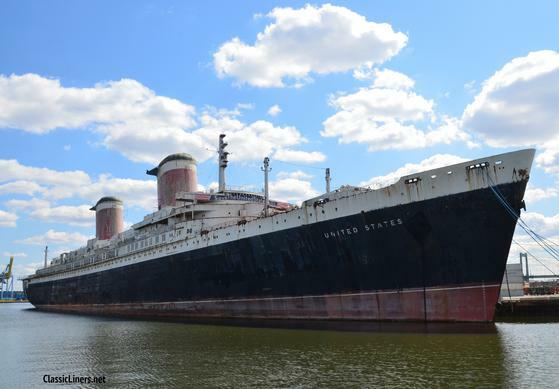 places the S.S. UNITED STATES on the market for sale with a ship broker. The fine print lists that the ship be sold to an American entity for non-scraping purposes. July 30, 2009 A Philadelphia media entrepreneur and philanthropist named H. F. Lenfest, pledges to a matching grant of $300,000 to help the United States Conservancy purchase the vessel from Star Cruises. July 1, 2010 The United States Conservancy hosts a 'National Flagship Celebration' in Philadelphia in the parking lot of IKEA. Before the lighting of the funnels, mast and bridge as seen below, a major announcement in the efforts to save the ship are made before the gathering audience that H.F. (Gerry) Lenfest has made a donation of up to $5.8 million towards the efforts to save the ship from being bought for scrap. 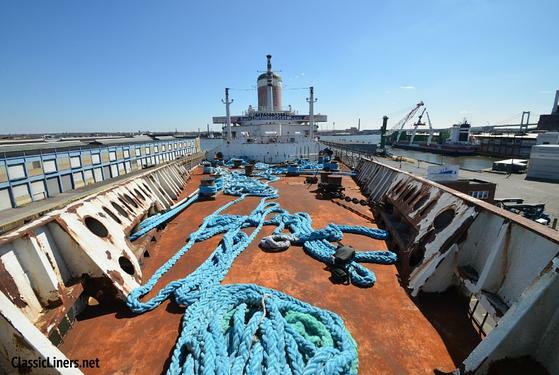 The money will be used to purchase the ship from its current owner and maintain the ship at its current berth for 20 months while plans are made to secure her future.